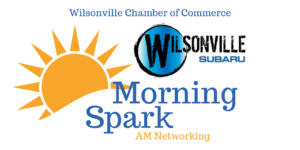 Join us for a fantastic morning of networking hosted by Wilsonville Subaru! Hear from General Manager, Ron Owens about their One Person, One Price, No Bull policy and browse through a selection of new and pre-owned Subaru vehicles housed in the dealership’s 91,000 sq. ft indoor facility. Promote Yourself and Your Company – Consider bringing a raffle prize to one of our Morning Sparks or After-Hours Networking events…attached your business card and we will give you an AWESOME shout out!